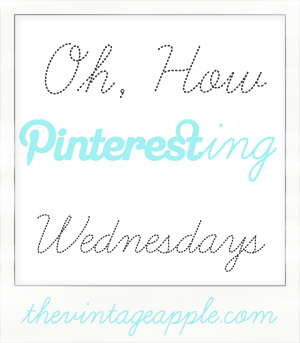 Today I am linking up with the vintage apple and will be showing some favorite "pins". I am going to focus on recipes because I have found some yummy pictures and I can not wait to try them out! I have not quite figured out how to directly link the pin to the blog. I'm still new to this. None of the instructions are working for me. So I'll try to link the description to the pinned page. This looks so yummy, I might just make this as soon as I finish this post. I'm thinking this with some apple slices might be yummy for Josh & Chloe's after-school snack. I think I'm going to make these Monday night for dinner before we go trick-or-treating. I need to figure out the rest of the meal. I'm sure Pinterest will be involved in the search. My sister-in-law made this last year and I forgot about how much I loved it until I saw it on one of Star's boards. I am a big fan of her blog and I have found myself repeatedly re-pinning her stuff. She has great taste... Pink, baking, Target, Twilight! Um, YUM! I'm having company for dinner this weekend. I'm making my mom's lasagna recipe. So super excited. I am thinking this may be an option for dessert. The question is, am I brave enough? or will I be searching for a chocolate cake recipe? Who doesn't love chocolate cake? Got a recipe you can suggest? If not, that's okay, I'll go pinning! Tyler just woke up, no time to proof-read. Hope it's not too messy Have a great afternoon!! i want to try that fruit salsa. it looks really good! I have four beautiful children and an amazing husband. I love nap time because that's when I can paint my nails!